The best way for your fundraising campaign to succeed is for your participants to be involved in the fundraising effort. To that end, we have revamped the Participant and Team Captain Fundraising centers to be mobile friendly and more intuitive. Now, the participant's "story" edit area is on the main fundraising center page, making it easy to find and update. In addition, when a participant logs in for the first time, they are guided through the process of setting up their fundraising center by the tortoise and the hare. 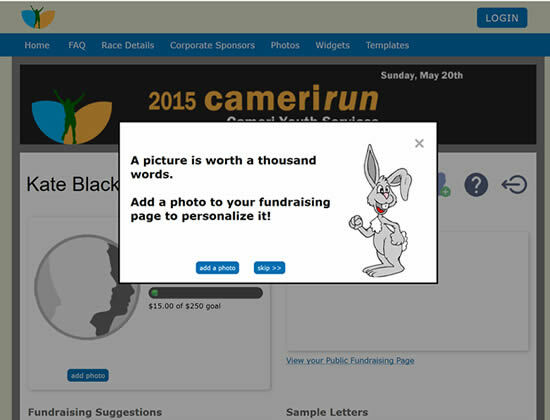 Participants are guided to upload a photo and to write an explanation, for people viewing their fundraising page, as to why they are participating in your event and why someone should give to your worthy cause. The Participant FAQs section of our website has been updated to reflect all of these changes. On occasion, we have customers who set up their own teams in advance of registration, and do not want participants to be able to create a new teams. A new option to handle this scenario is now available! Additionally, there are some events where the customer only want to allow team registrations. Now, you can disable individual registrations and only allow team registrations. 80% of registrations put through Wizathon are for one participant. If only one participant registers OR a team captain registers with other participants, the one participant or team captain's name and email address will automatically be filled in the registration details section during checkout. Of course, the name on the checkout page can be overridden, if needed, but this should save most registrants some data entry during checkout. Listed below are some new features available. There have been instances when a sponsor means to donate $10.00, but accidentally enters $1000.00. For any sponsor amount over $999.99, Wizathon will ask the sponsor if they are sure they want to donate the amount entered. When a past participant registers for an event and logs in during the registration process, their photo and story are copied from the previous event. As well, if they had set up a thank you note template, that, too, will now be copied over. For Wepay account holders, through Wizathon, you can now update the name of your Wepay account to match your event name after resetting an event for a new year. Under the Setup/Tools menu, you will have the option to do this update if Wizathon finds that your event name and the Wepay account name do not match. Transparent PNGs where uploading with a black background under Manage Logos. This was fixed. Does Wizathon allow a Group to Form a Team?